These Wasabi & Soy Roasted Almonds are a wonderful snack treat, and they can be made as spicy and hot as you like. I've bought the packaged Blue Diamond version of these in the U.S. in the past. I find these to be as good, if not better, and they contain no chemicals that I can't pronounce. 6 tbsp Wasabi Powder - NOTE: DO NOT roast your Wasabi powder. The oven heat will destroy the Wasabi flavor. Spread the almonds out evenly on the cookie sheet and roast for 12 to 15 minutes, just until they begin to toast. While the almonds are toasting, thoroughly mix all the wet ingredients in a large bowl, and mix all the dry ingredients in a small bowl or measuring cup. When the almonds are toasted, transfer them to the bowl with the wet ingredients. Mix thoroughly to coat all the nuts and return them to the cookie sheet with a large slotted spoon or spider web strainer. This method allows the excess liquid to drain off. Spread the almonds out evenly on the cookie sheet and return them to the hot over for another 12 minutes. Stir them once at the the halfway point. While the almonds roast in the soy sauce mixture, wash and dry the large bowl. When the almonds finish roasting, transfer them back to the large mixing bowl and pour all the dry ingredients over the hot nuts. 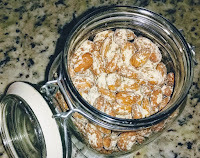 Toss the almonds to thoroughly coat them with the dry powder mixture. Spread the nuts out again on the cookie sheet to allow them to cool. As they cool they will begin to crisp up and the powder will stick to the almonds better. 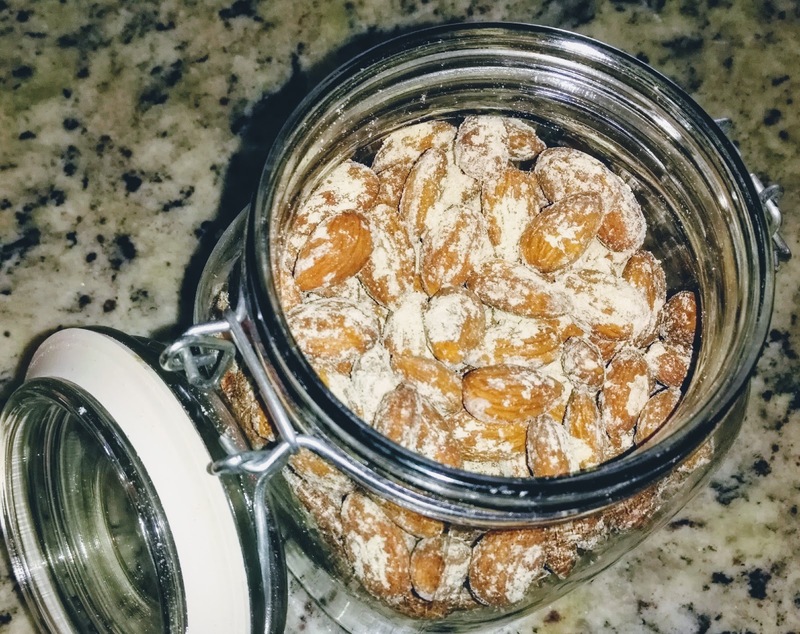 When the almonds are completely cooled, transfer them to a airtight container to keep them fresh. You can shake off the excess powdered spices if you like a milder nut. I like the spicier taste, so I don't remove the excess spices. I just sprinkle it on top of the almonds before I seal the container.